Engine : – 2 cylinder in V, “Automoto-Moser”, bore size: 56 mm – Stroke : 70mm – operated by valves. 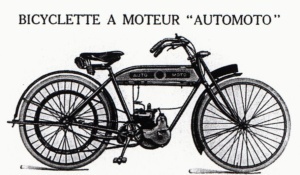 Carbu : “Automoto-Moser” with throttle slide control on the handlebars – throttle on the carburetor for corresponding air flow. Gas tank : nickel plated and ornamented copper with a met a capacity of 6 liters of gasoline and 1 liter of oil. – drain tap. Frame: made from straight tubes, at the bottom interrupted to allow support of the engine by steel engine plates. Distant between ground level and the central top tube 0,725 meter. Tires: “Continental” 600 x 50, enforced behind. 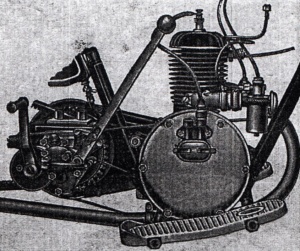 An agreement with the Swiss motorcycle manufacturer Moser was made for the production of the Mono cylinders 2 HP ( bore size 68 x stroke 78 mm, volume 283,3 cc ) and the two cylinders in V of 2,75 HP ( bore size 68 x stroke 78 mm, volume 552,2 cc). Magneto ignition and carburetors were made by Moser. The frame parts look like to be copy’s of the Moto-Rêve. 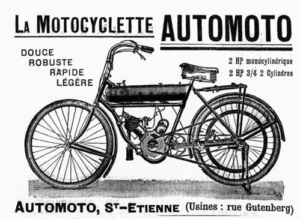 And because these frames were offered rough to be used by manufactures, you can ask yourself if it wasn’t a Moto-Rêve frame that was delivered for some time in St-Etienne . This hypothesis is worked out through the following argument. 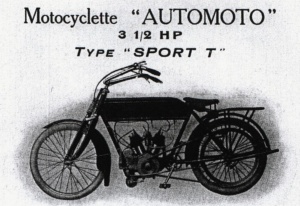 An excellent illustration from the catalog of Moto-Rêve of 1913,shows the tw0 cylinder type C on the same scale as the drawing of the two cylinder Automoto, published in the edition “Cycles et Automobiles Industriels”; then the frame of the Moto-Rêve was turned and the frame of the Geneva motorcycle was overlay-ed on the stéphanoise (Automoto) motorcycle. As the sequence of the 4 illustrations on the left proves, a certain doubt is justified. 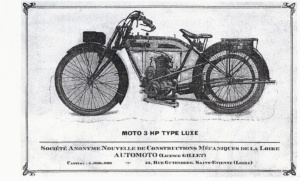 The frames of some Moto-Rêve’s of 1912 and 1913 are more likely to originate from Automoto even though they were differently equipped in Genèva. Tank … … Nickel plated copper, volume 5 liter gas and 2 liter oil. Tires … … “Persan” enforced. 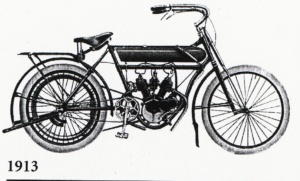 On the right, a photo from the 1912 catalog, showing the right side of the motorcycle, this time equipped with the swinging fork. The same basic models, offered for, respectively, 850 and 950 Francs. There are two catalogs, one with a purple cover and one with a maroon cover. 1913 – In 1913 a complete reversal took place: In a new chassis, now far more modern, 2 Moser side-valves engines were built in: The type T , got the “promised” old two-cylinder 3,5 HP ( without any modification of the dimensions: still a bore size 68 x stroke 76 mm for 552,2 cc), on the other hand the model M profited from a new vertical mono cylinder of 2,5 HP (bore size 68 x stroke 80 mm, being 290,5 cc); completely different than the previous 2 HP engine. A clutch was an option , but the beautiful hanging front fork made by “Wright”, brought to you by the firm, was being used. It seemed like that, despite the accompanying catalogs which weren’t dated, the models of 1912 were further sold under the name SCL till the beginning of World War I in 1914. The engines were still delivered by Moser, but now had the inscription Automoto. “Our new clutch with a kind of plates, what seemed best for the motorcycle, it allows the maximum progressiveness and gives the slightest tension. We felt a need to shift from annoying sticking out pulleys and clutches which were realized by the tension of the drive belt, which is a second choice and a poor technical solution, with a frequent irregular operation which caused the rapid wear of the belts, and had no other benefit than a lower second-hand price. 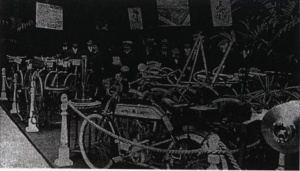 Just one motorcycle during the Salon in 1913; the bicycle is dominant. The range was significantly expanded: with a 2 1/2 HP mono cylinder type M and a 3 1/2 HP mono cylinder (type to be specified further); a two cylinder, 2 3/4 HP which reappeared under the name type D, a 3 1/2 HP type T stays maintained, however a 6 HP appears ( type not established), whereby the latter two models could be supplied with sidecars. Two kinds of clutches and forks depending on the cylinder volume of the engine. In addition to the standard versions, the so called “Tourists” versions, were offered as the “Luxe” versions; the main difference was the belt tensioner. You could have a clutch with gear drive on a engine pulley with a big diameter for the 2 1/2 mono cylinder and the 31/2 two cylinder , which was a positive contribution to the performance of the belt and to limit slippage. 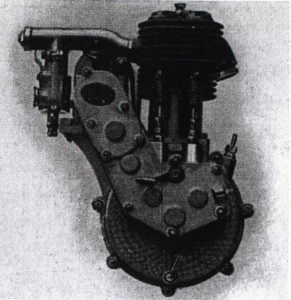 They were identical – a picture from a catalog to prove it – a combination of a clutch with gear drive with chain drive, that made sure the 3 1/2 PK “Sport T” was placed in the top range of the technology. At last the possibility of a rear hub with clutch appeared and 2 or 3 gears for the “Touriste” and “Luxe” versions; on invoices 420 or 470 francs. When no brand like Armstrong or Sturmey-Archer was added people thought that they were home made. Engine : – 2 cylinder in V, “Automoto-Moser”, bore size: 56 mm – stroke : 70mm – valve operated. Only the equipment of the “Automoto” factories can realize such a perfect machine for such a low price. 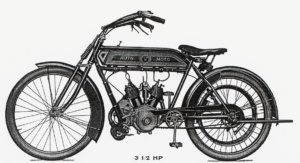 Engine : – 2 cylinder in V, “Automoto-Moser”, bore size: 68 mm – stroke: 76mm – valve operated. 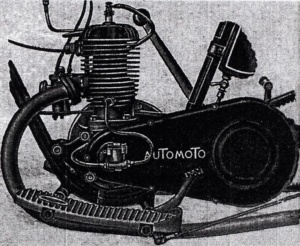 Carbu : “Automoto-Moser” with throttle slide control to the handlebar – throttle on the carburetor for corresponding air flow. Gas tank : copper, descending from behind, extra luxurious decorated – filter in fuel pipe – drain tap. Drive: By trapezoidal drive belt, extra reinforced, choice of leather “Houben” or rubber. Belt tensioner: patented “Automoto”, functions automatically. Springy Front fork : “Automoto” a double jointed parallelogram. Two brakes: Front and rear- braking on the pulley-rim, one controlled by a pedal and the second controlled by a lever at the handlebar. Frame : lowered at the back – top central tube, arched – covered with enameled black lacquer and decorated with lines. Tires : “Continental” 600 x 50, enforced behind. Ideal machine for many rides through the country. 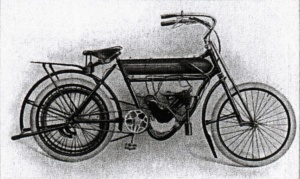 People saw the rise of the “Sport” T of D versions with lowered frame and an alternative free silencer controlled by a pedal. In those days motorcycles had an exhaust without significant damping materials in their silencers. These were not used because the 2 and 3 HP engines from those days didn’t have so much power at all and wouldn’t have any power left if used. So they all rode merrily around with a hollow exhaust with a lot of noise. This wasn’t a big problem in the open French country, but in the cities, towns and villages there soon came regulations to restrict the noise. So manufacturers built in the exhaust a kind of valve which closed off the exhaust almost (and muffled the noise) by which the problem was solved cheaply once more. Once outside the cities and villages you were able to open the valve with a foot pedal while riding your bike and you had all power (and noise) at your disposal. The drive of this “Sport T” was a combination of a clutch with gear drive and a chain drive: ahead of its time! There was an error in the assessment of the 500 by the race with the 350 which had basically one cylinder of 452cc. Engine: mono cylinder vertical. Operated by valves. Tw0 brakes : Front and rear- braking on the pulley-rim, one controlled by a pedal and the second controlled by a lever at the handlebar. Price: with 350 cc engine, bore size 70 mm, stroke 90 mm 1900 fr. Price: with 500 cc engine, bore size 80 mm, stroke 70 mm 2100 fr. There was a clutch with gear drive available for the 2 1/2 mono cylinder and 3 1/2 two cylinder to use on a engine pulley with a larger diameter, which benefited the good performances of the tire and to limit the slipping. They were identical to the combination of a clutch with chain drive which placed the 3 1/2 HP “Sport T” earlier in the forefront of technology. Sturmey-Archer ), causing people to believe they were home-made. And last but not least, the icing on the cake, two (or three) “competition customers” were offered the 350 cc and 500 cc… this was a way to negotiate the price: 1900 fr. and 2100 fr. for the first place! The whole Moser engine series. The nice front fork was, now, called Automoto and not Wright… The production, despite high prices, had to be big enough judging from the number of surviving motorcycles. There was even found a type “350 course”. In a state…. 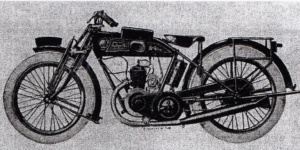 This 550 racing model was listed on page 7 of the 1914 catalog…with luggage carrier. Did it really exist or was the cylinder named after the resemblance of a shell type graphic? Mysteriously. 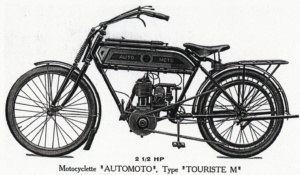 Some motorcycles with frames from the 1913 models and two-cylinder Moser engines, appeared as long as the stock lasted. Imagine, in the collection, a model equipped with an engine from 1906… the Ultima motorcycles succeeded in doing so. Assuming that it usually was custom to use the frames as long as the stock lasted. The start of selling bicycles and other activities, didn’t make it necessary to return to the motorized bikes before that date. A first attempt of selling a motorcycle would have been the offering of a 350 Gillet d’Herstal two stroke. I never had heard of it, but a catalog by Oliver Loungueville was found and this was irrefutable evidence. How many bikes were sold? Perhaps none. 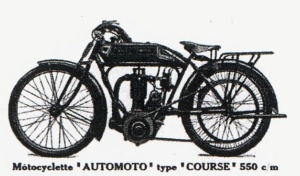 The Automoto-Gillet “Luxe” as presented in a prospectus dated in 1922. The effectiveness of the marketing strategy was more than questionable. The return of the motorcycle was a fact by the way in which the original bike with auxiliary engine was inspired by the Evans Cycle engine. Remains remarkable that the drive pulley could be slid aside and forward of the block to allow a longer belt. Taken closer, rightly, because it promoted the starting procedure well. Internal gear drive and a clutch with plates were certainly not the things as common as on a lighter motorcycle. Well presented and a good price, these motorcycles, named type MA, sold very well at the beginning of 1923. Undoubtedly encouraged by this success the firm repeated the general plan when launching the MB, but equipped with two gears and a kick-starter. Very soon the cylinder capacity of the MC type would be increased to 175 cc. The sale would not, far from that, match the one of the motorbike with auxiliary engine and their modernized tank. Only type MA was maintained. 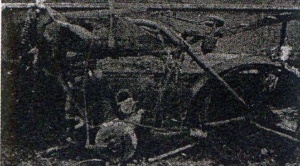 The 175 MH Jap engine Aza appears secretly. The next series of the 175 MF engine Automoto shall known a great success. Including the sport version. We saw a magnetic flywheel ignition and the separate lubrication by a pump which was placed on the carter of the primary drive, by the way, the indention was a construction seen on every other versions. The same engine equiped the MS series, more economically with a direct belt drive and magnetic ignition with flywheel. Evolution, still in 1925, of the 100cm3 MA ( which was a BMA before its time, auto registration didn’t exist yet ) which received a new tank and an other handlebar and which was presented with a speedometer… as an option mounted. The tank stickers as “signature” ( D185 reference, length 132 mm ) were more and more replaced by separating “Auto” en “Moto” by a little clover. 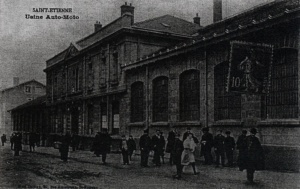 On the first of April 1926 the Sociëtë Française des Boîtes Campbell was founded which, although a seemingly separate existing, with the headquarter in the Bron, in the neighbourhood of Lyon, appeared to have been a pure emanation of Automoto. For the first time type “P with gear drive” appeared which was a simplified version of the 175 MF equipped with a gearbox, but, instead of the gearbox equipped with a delay box? with clutch and pedals (Transmission system which causes a decrease of speed due to a (inhibitory) increase of the torque. This was achieved by shifting a load gear and/or flywheel, which reduced the speed of rotation of the drive shaft.) In 1925 the name MS employée was replaced by the type “P without gear drive” in 1926. Finally the beginning of the four-stroke series GM. First with a 250 Moser. This model would be, in general,more or less form the basic model of all the following Automotos till 1930. 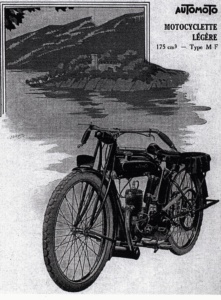 Without question a 250cc Automoto from February 1927. The engine with a half round cylinder head is from Moser. In February Moser was replaced by a Zürcher. A “lateral” version equipped with a JAP will follow. These were fine machines equipped with a Webb front fork which gave it a amazing modern look. Boîtes Campbell, of course. MF1: “Populaire”, swing front fork, released the clutch with a kick but without a gear box. Belt driven. No front break. Simple exhaust. It replaced type P with gear drive. 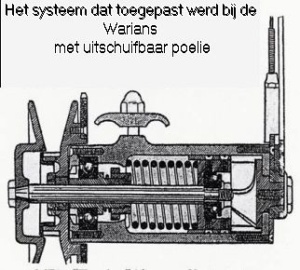 MF2: “Warians”: The same, but with changing gear by an adjustable pulley. Also known as “W”, or sometimes MS. MF3: “Touriste” likewise with an exception of a two-speed gear box. MF4: “Sport” double exhaust, three speed gear box and chain chain drive. Webbs front fork. Drum brake at front. 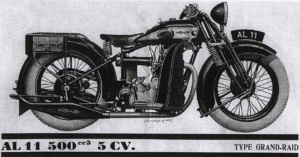 The exhibition in October 1927 saw a truly explosion of the range of motorcycles together with the trade of all “A quelque-chose”. So the MF4 got the pressed line and shape of the tank of the GM and became the A1. The same development happened to the MF1 named “Touriste populaire”. But the disappearing of the egg shaped (ovoid) tank, and more strangely, the Webbs front fork was badly accepted by the customers. At production we saw the use of a lateral 350 engine “maison”, which was purely inspired on the Blackburn; the equipment of the A3. 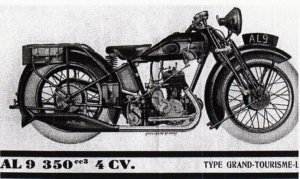 Generalisation of the décalque ( the print on the tank, or the side panel, with respectively, the name of the brand and/or the type classification. This along both sides: in this case the brand AuTomoTo ) in slat-shaped letters (characters), with the lines of the (letters) T protruding. The decoration of the tank and the jerrycan for gasoline for the two-stroke was the classical “flammé” of the parent company on a grey background. 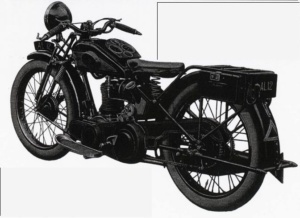 The 175 A1 “Bol d’Or” of 1928 which succeeded the MF Sport of 1927. Pay attention to the very beautiful original exhaust. 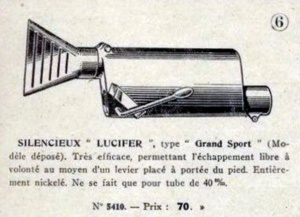 The MF “Sport” with double exhaust of 1927. A7 belt driven and equipped with a two-speed Campbell gear box. A8 belt driven and the same gear box as the A7. – A4: the same driving parts as the A3, but with a (Swiss engine) Zurcher 350cc with tumblers and external flywheel = Sport-Confort. – A6: 500 JAP overhead valve engine = “Grand-Sport-Confort” Within the year two extra models appear. 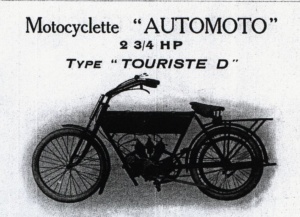 – A7: 175 economical; that was, approximately, a MF3 with a tank of an A1 mounted which was called “Touriste Populaire”; 2 gears and belt driven. – A8: Likewise the A7, except with chain transmission; This version did not have another name. 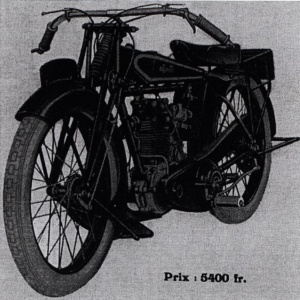 Towards the end of 1928, undoubtedly at the moment of the exhibition, A booklet was published, in which still the 175 A7 was shown, which, previously was known as the model “populaire”, now named “Confort” and the old A1 “Bol d’Or”, renamed AS8 ” Sport-confort”. The AL8 “confort-Luxe” and the ASL8 “Sport-Confort-Luxe “ were added now, which were nothing else than the models A8 or AS8, equipped with electrical illumination from Alterno-France. All 175 cc models held their (between the tubes) gastank. Just a further explanation about the name(s) of the various models. This regards for almost every model of every French brand before the ’30. 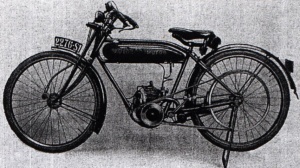 The letter “A” stood for the name of the (first version) basic model of a motorbike. This means, that as long as the bicycle part, the engine or the tank didn’t change, the basic name “A” was kept during the production. If one of these three elements was adapted / renewed , The model got a “B” name as the first letter in its model name. Next there could be : S=Sport, L= luxe, C= Confort , P= populaire, etc., depending on a change in equipment and / or presentation. After 1930, the model names became more clearer according to brand and equipment and power. thee AL 12 250cc “Luxe”with 4 gears. In the same booklet the A3 was presented again. End 1928 the striking saddle tank for a micro serie of the JAP 250 cc head valve engine was outsourced to Styl’son. Thereafter, on a no further date, the complete serie from 1929 became the subject of a large catalog with foldable pages. 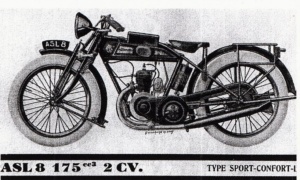 The 175 disappeared just as the A7, while all other models became the new four strokes with saddle tanks which were available with or without electrical illumination (in this case the letter A is followed by the letter L ) driven by the dynamo and the battery. The A9 350 “Grand-Tourisme” and the AL9 “Grand-Tourisme-Luxe”: replaced the A3, in which they represented the bas-engine (71 x 88 mm), but with a cylinder with a seperate head, the first ones of cast iron and afterwards of aluminum. The A10 350 “Grand-Sport-Monobloc” and the AL10 “Grand-Luxe”, the A11 500 “Super-Sport-Monobloc” and the AL11”Grand-raid” with Chaise bloc engine by ACT; by using this engine their nick names became “les batteuses” (threshers): They replaced the A5 and the A6 which became to expensive to produce. 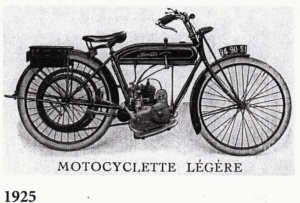 The A12 250 “Touriste” and the AL12 “Touriste-Luxe”: engines lowered til 250 cc ( the bore size 60 mm instead of 71 mm ) of the A9 and the AL9, which replaced the A2. 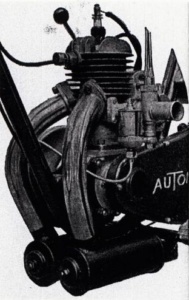 The A13: some factory documents mentioned an A13 with 350 cc engine: Whether it has been produced? There was a scale of colours available for the gas tanks varying from simple black enamel with golden piping till the nickel-plated with purple side panels (tankrubbers?) with ,apropos, in various grey or blue “Automoto”. In addition, the classic “flammé” was handmade, making it different from one machine to another. The next page gives an overview of all the model types of 1904-1929 and opens in a new tab. 1930 was a turning point and mayor changes were made in all directions of the mother company.